Category: *** Address: 13 Soveja St.
Total of 20 rooms are arranged in the form of double, triple and matrimonial. Room entrance is key card.They are equipped with air conditioning, minibar, free wireless internet, refrigerator, LCD TV, DVD. The bathroom is equipped with hairdryer and hydromassage shower. You can enjoy breakfast in room or restaurant. The hotel offers its clients the opportunity to relax in the caf�-bar where they serve coffee, tea and soft drinks. 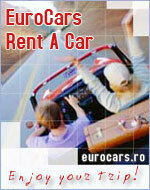 At a distance of 24 km is Kogalniceanu International Airport and the request will be beneficial to the airport.